I was looking for some ways to use a bunch of cilantro I had on hand – and this recipe really appealed to me. I definitely took awhile to cook because of the brown rice – but totally worth it in the end. 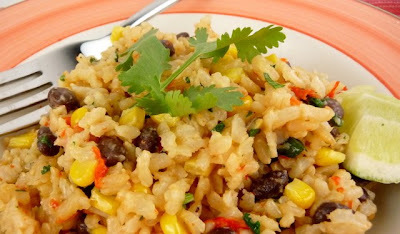 It was super flavorful and the corn provides a sweetness that really balances out the flavors. It’s super healthy too – I spent the week before I made this out of town for work and after eating out every day for a week – this meal was almost like a detox from restaurant food. 1. Preheat the oven to 375° F. Adjust an oven rack to the middle position. 2. Heat the oil in a large Dutch oven over medium heat until shimmering. Add the onion and bell pepper to the pan and cook, stirring occasionally, until well browned and tender, about 12-14 minutes. Stir in the garlic and cook just until fragrant, about 30 seconds. 3. Add the chicken broth and water to the pan. Bring the mixture to a boil. Remove the pot from the heat, stir in the rice and salt, and cover. 4. Bake in the oven until the rice is tender, 65-70 minutes. 5. Remove the pot from the oven and uncover. 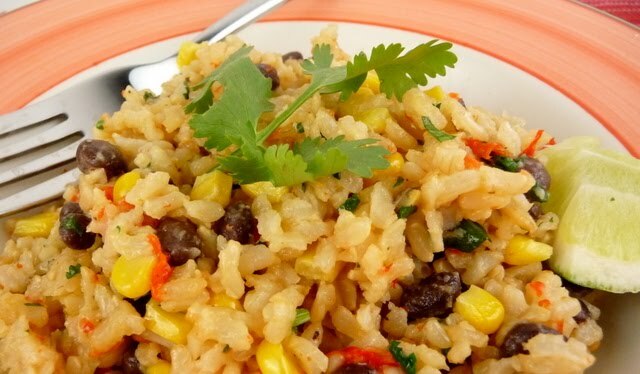 Fluff the rice with a fork, stir in the beans and corn, and replace the lid. Let stand for 5 minutes. Mix in the cilantro and black pepper. Serve.